As Lena navigates the increasingly dangerous terrain of the Wilds, her best friend, Hana, lives a safe, loveless life in Portland as the fiancée of the young mayor.Requiem is told from the perspectives of both Lena and her friend Hana. They live side by side in a world that divides them until, at last, their stories converge. Lena is back in the wilds, now a fully fledged member of the Resistance. As she tries to survive, she is torn between Julian, the boy she loved and saved, and Alex, the boy who loved and saved her. Meanwhile, her former best friend, Hana, has been cured and is preparing for her marriage to the mayor of Portland. As Hana ponders what her life has become without love, she makes some shocking discoveries. Lena and Hana's lives finally collide as they realize that maybe they aren't so different after all. What a roller coaster this series was. Unfortunately, I am not referring to the plot or the emotions I felt while reading. I absolutely loved the first book, but then the series took a turn for the worse in book two, when the structure of the storytelling was suddenly changed. The structure was altered once again in Requiem, and this constant flip-flopping of storytelling eventually became too much for me. Book two, Pandemonium, was told completely in Lena's perspective, but following two different timelines - "Then" and "Now." What disappointed me the most about Pandemonium was the "Then" chapters, in which Lena was in the wilds with the members of the resistance. Those chapters were so incredibly boring. Requiem was told on one timeline, but following the dual perspectives of Lena and her best friend, Hana, who we haven't seen since Delirium. Once again, Lena was SO BORING. She spent almost the entire book surviving in the wilds and joining the resistance. I found myself not caring at all about her struggles in the wilderness and her love triangle with Julian and Alex. Conversely, I really loved Hana's chapters. I found it so interesting to get inside the head of someone who had been cured and see how their life had changed after the procedure. One of my favorite aspects of Delirium was learning about the society and the beliefs surrounding the fear of love as a disease. It was really nice to see this theme popping up again and to learn more about how different members of the society dealt with the cure. I wish there was even more in this series about Hana, because she became infinitely more interesting than Lena and her love triangle. Ultimately, this series really let me down. 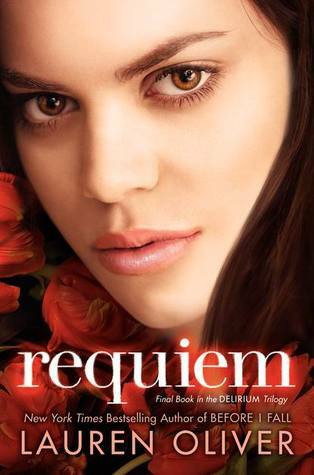 I was so interested and excited after reading the first book, but the second book was awful, and Requiem did not offer any kind of redemption for the series. Hana's chapters were wonderful, but it wasn't enough for me to change my rating. I really think that having a different structure for each book was a poor decision and became a detriment to the series. Having dual perspectives for Lena and Hana throughout the whole series would have made the story more interesting and maintained continuity for all three books.